Hey Little Prairie Girl Fans! and ‘share’ the big post card picture to your own Facebook wall or page! Let me tell you, you will be happy you did once the secret is revealed. I hope you have made plans to attend one or both days! If you haven’t noticed yet, the times are a little different this sale. So please make note! As of now, there are around 27 booths for this sale! Shabby Shack has moved locations…. from the loft in the Barn out to the Machine Shed. Hopefully it will be a little easier for Mel and gang, as well as for all of you, to move your fabulous finds. In that former space, there are now 3 new vendors. In addition, there is a new floral area for silks. Do you believe that I haven’t even shared the secret yet? Not until next week after there are more ‘likes’. 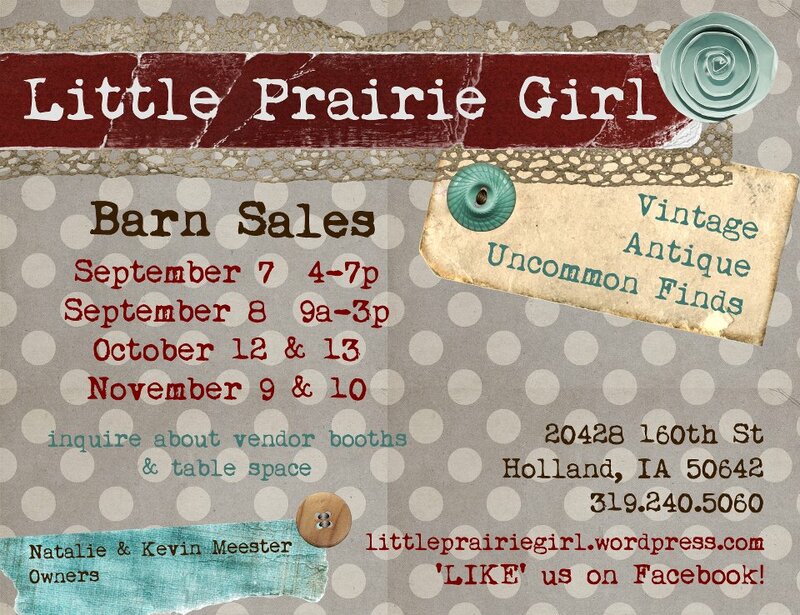 So, head over to the LPG Facebook page and share the Barn Sale details. Be watching next week as I hope to post some fun little sneak peeks!